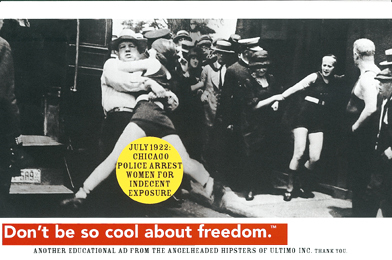 Don't Be So Cool About Freedom | Graphic Design NY | Clare Ultimo Inc.
07. 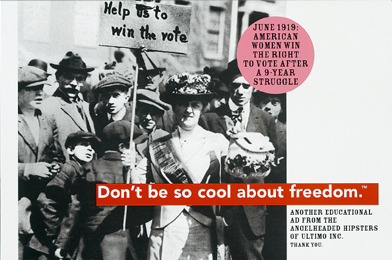 "Don't Be So Cool About Freedom"
These posters were created by Clare Ultimo for an exhibition at Hunter College, NYC called "Freedom in Democracy" in 1997. The exhibition was initiated by Stuart Ewen, Chairman of the Hunter Communications Department. They were exhibited at the school for a limited time to raise student awareness on a variety of issues. 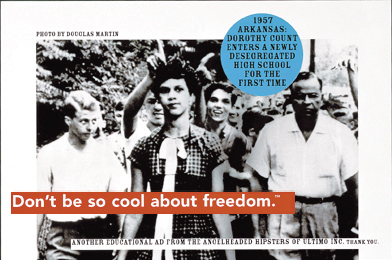 My idea was to show a little history around certain freedoms we take for granted today. These old newspaper photos really capture the time when things like the women's vote, wearing a bathing suit in public, and the desegregation of our school system were not personal freedoms we enjoyed in America. It's great we can look back on these Neanderthal ideas and laugh, but it's even better for us all to notice that our freedoms as Americans are so fragile Ð this seems to be even more true today. Stuart is the author of "All Consuming Images" and "PR! ", among other things. Lots of designers (as well as all sorts of other people) find Stuart to be very smart; we certainly agree. Find out more about him in the Heroes section of our Links page.